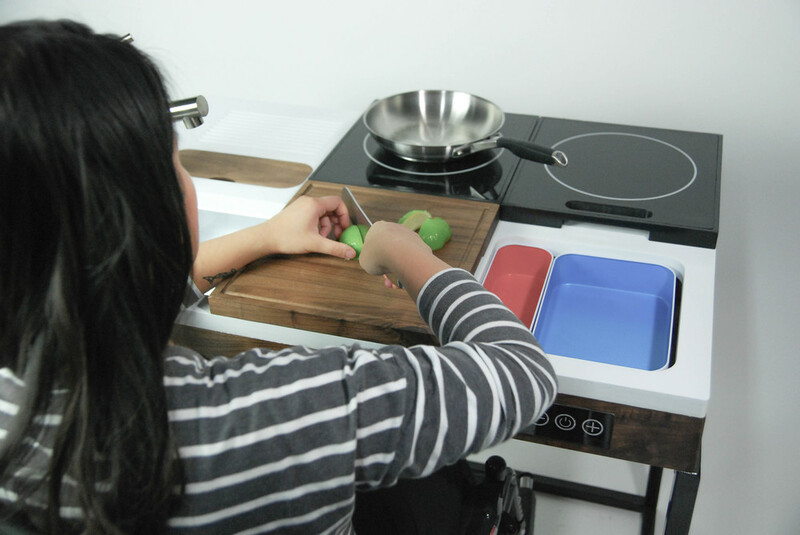 UMAI is a compact kitchen unit designed for wheelchair users. It contains a cooktop, sink, storage space, cutting board and trash can. While wheelchair users can stay in one place to access most kitchen features, it reduces the need to repeatedly move around the kitchen. It also provides proper knee space and adjustable countertop for each individual’s height. A system of magnets is embedded in the countertop, cooktops and cutting board as a guide for moving each feature above the kitchen unit. With the freedom of moving the cutting board and cooktops, users can arrange these features according to their need during the cooking process. I was born able-bodied and did not experience any kind of physical difficulty in my life. Being able to walk, talk, see and listen is such a normal thing to me, but there are people born with disabilities and experience all kinds of inconvenience every day. Living like a normal person has become such an unaffordable wish for them. I think everyone deserve the right to enjoy every part of the convenience that the modern world has provided. Thus, as a designer, I want to utilize the power of design and eliminate the gap between the world and the people with disabilities through this project. In most cases, it takes a certain amount of money to build a wheelchair friendly kitchen and requires a huge construction. In order to cook in a non-adapted kitchen, wheelchair users tend to force themselves to adapt their own kitchen. However, there are still some issues that are difficult to solve, including reaching high cabinets, getting closer to the counter without working sideways, moving around the kitchen, etc. Thus, this project focus on improving the kitchen accessibility for wheelchair users, make it easier and more efficient for them to complete the cooking tasks. In the simulation exercise. I put myself in a wheelchair and went through the cooking process in my own kitchen, a non adapted kitchen. The whole cooking time was much longer then usual. I faced a lot of issues while cooking. There was no space for my wheelchair under the counter, thus I need to work sideway while using the counter, the stove and the sink. The height of the counter is too high for my, so I need to have a cutting board on my lap in order to do some preparation tasks. Getting items from the higher cabinet was also a big challenge for me. According a survey I conducted, I realized that cooking plays an important part for most wheelchair users. More than 70% of the participants cook everyday, and being able to cook by themselves make them feel more independent. Cooking is not just something that feed them and keep them alive, but also something that support them from mental side. However, surprisingly only half of them own a wheelchair friendly kitchen. Many companies have been working on designing adapted kitchen for a long time, but the majority existing features are still designed for a bigger kitchen, not small one, and they usually cost a lot and require a massive construction to renovate. So I started to ask myself, what can I do for them? Can I make an impact by design something for them? The interviews were conducted through all email, phone calls and conversion in person. Interview subjects include more than 6 people, all living in a wheelchair now. The injury level of each of them are different and the time they have spent in the wheelchair are also different, from 1 year to 50 years. This diversity of interview subjects provides me a wide range of points of views. They shared their thought about the existing kitchen and demonstrated how they manage their own kitchen, given me a better understanding about cooking in a wheelchair. By observing wheelchair users in the kitchen help me to understand how wheelchair arrange their items in the kitchen and how they developed their own way to utilize the kitchen features. I mapped out the whole cooking process into a 3D map and to know their working path. From the first diagram, we can see that he spent most of his time around the cooktop and sink/counter. The explanation for this could be traced back to the beginning of the video while he started the cooking process by gathering all of the tools he needed and bring them to the counter. The time that he had to maneuver in the kitchen was the time while he needed some plates, utensil and the plastic bag that he did not get at the first time. Most interestingly, in subject No.2, he had a desk outside of his kitchen, and he did most of the work on that desk which provide a better working height and a space for his wheelchair underneath. 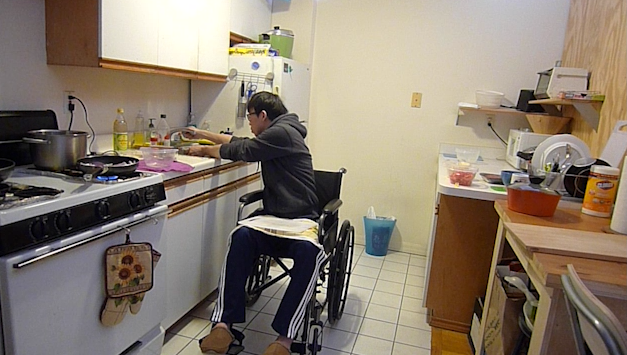 Excessive Traveling in Kitchen is a major issue for wheelchair users to perform cooking tasks. To use each features in the kitchen, wheelchair users often have to move around the kitchen which is time-consuming and difficult for most of them, especially a small kitchen. Working Height is basically fixed when the kitchen counter/island is being installed. Without a wheelchair that can adjust the height, this become an issuer for them. Therefore, some wheelchair users would have a cutting board on the lap, which provides a working space with a more proper height and a better cutting angle for them. Knee Space and Working Sideways refers to twisting their upper body while accessing the features on the countertop. For the wheelchair users who do not have an adapted kitchen, they could not place their wheelchair under the working counter and most of the kitchen counters have cabinets under it. Without a space underneath the countertop, it hard for them to get closer to the working area and force them have to twist their upper body in order use the countertop and other features on it. It is a very unpleasant gesture to work, especially for someone with weaker core muscle. There are companies working on designing adapted kitchen features, however most adapted kitchen features in the market are still designed for bigger kitchen and usually expensive. According to the research, most wheelchair users do not own an adapted kitchen are due to lack of the budget, or the permission to do the kitchen renovation construction. Thus, this project will target the users who have a small kitchen with little budget and minimize the construction work. The most common rule to design or arrange the appliances in these kitchen is to form a working triangle between “cooktop”,”sink” and “refrigerator”. The main idea is to keep these appliances close to each other and keep the kitchen more efficient. This kind of arrangement is a tried-and-true method for convenience and workability. This design method applies to not only just able-bodied people, but also to wheelchair users. Wheelchair users move around in the kitchen between each feature during cooking process. It is time consuming and difficult especially in small kitchen. To solve the issue of excessive traveling, my design solution is to minimize the working triangle by combining the cooktop, sink and storage space into one single kitchen unit and eliminate the need to travel between each feature. As for the knee-space problem, with a leg adjuster, UMAI can provides proper knee space and countertop height for each individual user. With a space underneath the countertop helps the users to get closer to the working area and eliminate the need for twisting their body while cooking. UMAI condenses major kitchen features into the size of a standard modular kitchen cabinet 36” by 24”. The countertop height will be adjustable from 28-36”. The standard size make it easier for users to put it into their own kitchen by simply replacing an existing sink or cabinet. Saving money and reduce the construction work of renovation. The two induction cooktops allow users to cook two dishes at the same time. Users can move the cooktop closer for a better working distance or they can push the cooktop to the back while using cutting board or other features. The handle on the cooktop help users to pull it, even with restriction of using their hand muscle. With the freedom of moving the cutting board and cooktops, users can arrange these features according to their need during the cooking process. The control panel for the cooktop is located in the front of the kitchen unit. This makes it easier for users to reach and the enlarged button also helps them to operate. The cutting board can slide above the front part of the countertop. The cutting board and the cooktop share the same height, so users can use the cutting board to slide the pot between faucet and cooktop, keeping the heat and electricity away from water. The cutting board can be detached from the countertop and serve as a usual cutting board or a platform for transferring items from another cabinet. The storage space is hidden underneath the cooktops and provide the space for needed utensils, cooking tools or some plates. Users can access the storage space by sliding the cooktop sideways. The food container is a place for users to put the ingredient before using them for cooking. It is positioned on the side on the cutting board. By simply push down the cut ingredient into the container, it helps some wheelchair users who have difficulties picking up due to the lack of hand muscle. The containers can be detached for cleaning and can be replaced by users’ own containers.